I recently watched the new release, R.I.P.D. and was pleasantly surprised. 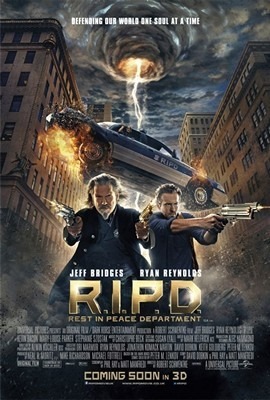 Starring Jeff Bridges and Ryan Reynolds as two deceased policemen, now working as cops in the afterlife, rounding up te\he Dead that just refuse to leave the living world. Ryan Reynolds’s character, Nick, was partnered with Hayes (played by Kevin Bacon), two cops in the living world. The two of them are well meaning but slightly crooked cops. When Nick decides it’s time to stop being crooked, Hayes decides maybe it’s time for Nick to go on to the other side. Once their Nick finds himself in front of Proctor, a police woman (or administrator) played by the always great Mary-Louise Parker, who informs him he has two choices: work as a cop in the afterlife, rounding up badies that refuse to go on to the nether world, or take his chance with judgement…after being a borderline bad cop. Deciding to take the role of a cop in R.I.P.D. He is partnered up with Roy, a cop that got his start as a Marshal in the Wild West, who has some serious issues with the way he died… and some seriously funny stories about what happened shortly after his death… Damned coyotes. The two decide to investigate the fact that the “Deadies” (the dead that won’t leave the living world), are ramping up activity and gathering some weird chunks of gold. Turns out there’s a bid plan that they are trying to hatch that will change the world as we and they know it. Of course, Hayes plays a hand in this too – he’s much more bad than we first thought (well, kinda – you kind’ know he’s dirt bag). This is a fun movie with lots of great looking “monsters” and story that made me laugh. Silly, yes, but completely fun. Watch this movie if you want a good laugh. I especially enjoyed the interesting relationship between Roy and Proctor, as well as James Hong running around with a banana (don’t worry: that sentence will make sense once you watch the movie). This entry was posted on October 22, 2013 by catfishman. It was filed under 2000's, Awesome, b movies, Bacon, civilization, comedy, confusion, cops, cover up, crazy, crime, death, different, entertaining, entertainment, epic, film, fun, funny, good, great, heist, horror, injustice, killers, movies, murder, original, paranoid, police, r.i.p.d., Sci-fi, Science Fiction, Society, supernatural, Terminator, theatre, trailers, Undead, watch, Western and was tagged with 2000's, awesome, B Movies, Bacon, civilization, comedy, confusion, cops, cover up, crazy, crime, death, different, entertaining, entertainment, epic, film, fun, funny, good, great, heist, horror, injustice, killers, movies, murder, original, paranoid, police, r.i.p.d., sci-fi, science fiction, Society, supernatural, terminator, theatre, trailers, undead, watch, western.